Roof Slope: Generally the steeper the roof, the better with regard to service life of slate. Anything above a 8:12 is preferred, and slopes in the 12:12 to 18:12 range are probably ideal. Not only will slate shingles last longer on these steeper slopes, but they will be more visible from grade and show off their natural beauty. Steeper roof slopes mean that rainwater will flow down and off the roof quickly which needs to be taken into account when looking at base flashing heights and gutter systems. 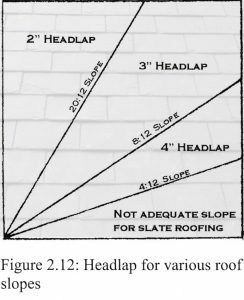 Headlap, Exposure, and Offset: Headlap and exposure are related to each other, and the starting point for determining both is roof slope. Laying slate with appropriate headlap and offset helps to accommodate wind-driven rain and the lateral movement of water below the slate shingles to prevent infiltration through the nail holes and side joints. 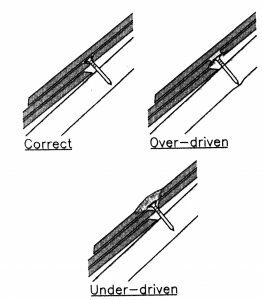 Minimum required headlaps and offsets should not be compromised. Moisture Migration: Considerations must be given to the extent to which water will migrate under the slate shingles. On the best functioning slate roofs, the water flows down slope parallel with the length of the shingle to the next lower shingles. In slate roofing, water migration is controlled primarily by the angle of the roof's slope. The steeper the slope, the less water migration there will be. Underlayments: Underlayments are installed on the roof deck, prior to the installation of the slate roofing shingles. Roof underlayments include traditional asphalt saturated organic felts as well as many synthetic underlayments and ice dam protection membranes. Underlayments serve several purposes, the most important of which are to protect the roof until all of the slate and associated flashings can be installed and to help control moisture migration when it occurs. 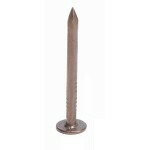 Slate Roofing Nails: It is critical that the nails used to secure roofing slates to the roof deck have an anticipated service life at least equal to that of the slate. For S-1 grade slates used in new roofing, large head, solid copper roofing nails are most often specified. Stainless steel roofing nails may also be used, especially for hard roof decks, but may make removal for repair work difficult. Nailing Slate: Slate shingles must hang on their nails. Over-nailing & under nailing can impose stresses on the slates and cause breakage. Setting the slating nail just right must be learned, but once learned it is a relatively easy task to master.